Catalytic asymmetric synthesis has been one of the most active research areas in chemistry (Nobel Prize in 2001). The development of efficient chiral catalysts plays a crucial role in asymmetric catalysis. Although many chiral ligands/catalysts have been developed in the past decades, the most efficient catalysts are derived from a few core structures, called "privileged chiral catalysts". This ultimate "must have" and long awaited reference for every chemist working in the field of asymmetric catalysis starts with the core structure of the catalysts, explaining why a certain ligand or catalyst is so successful. It describes in detail the history, the basic structural characteristics, and the applications of these "privileged catalysts". 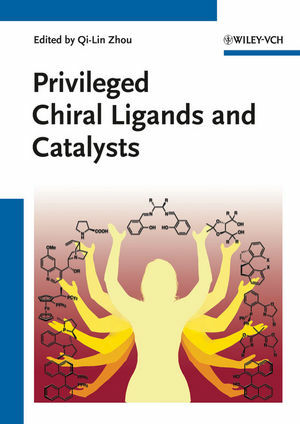 This novel presentation provides readers with a much deeper insight into the topic and makes it a must-have for organic chemists, catalytic chemists, chemists working with/on organometallics, chemists in industry, and libraries. Qi-Lin Zhou is the Director of the Institute of Elemento-organic Chemistry, Nankai University in Tianjin, China. He obtained his PhD degree at Shanghai Institute of Organic Chemistry. After several years of postdoctoral research (with professors Andreas Pfaltz and Michael Doyle et al.) he started his independent research in the field of asymmetric catalysis in China. Qi-Lin Zhou has authored over 100 scientific publications and has received many scientific awards including the Prize for Creation in Organic Synthesis (Chinese Chemical Society, Division of Organic Chemistry), Yao-Zeng Huang Prize of Organometallics (Chinese Chemical Society), and JSPS Fellowship Award (Japan Society for the Promotion of Science). He is also a member of different editorial boards such as Acc. Chem. Res..
Why Are Josiphos Ligands So Effective?